My usual photographer managed to get stuck in rush hour traffic on his way home from running some errands today, so I decided to awkwardly photograph these socks on my own feet. Hooray! 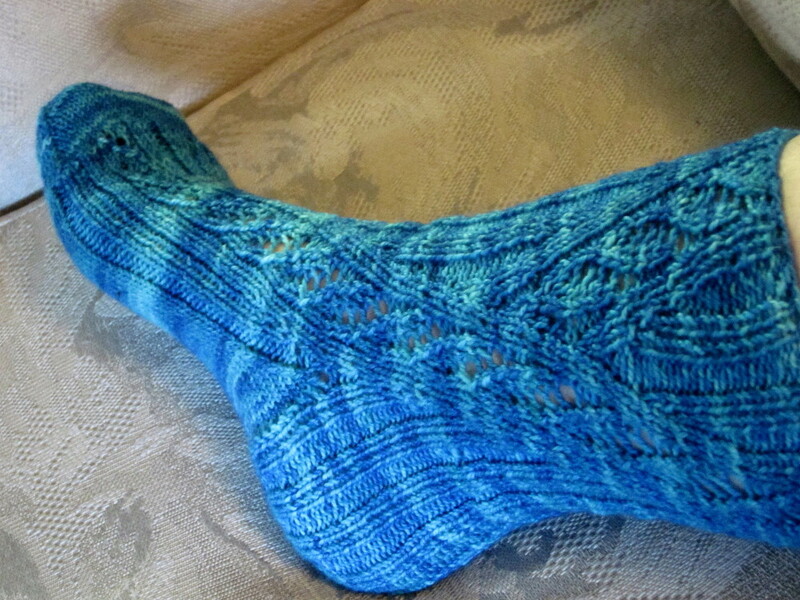 They are Thelonius Socks from Cookie A’s beautiful book Knit. Sock. Love., which I was lucky enough to buy from her and get signed at VogueKnitting LA last year. (Judging from the ridiculous prices on Amazon, I guess it’s out of print now! But you can still buy the e-book or individual patterns on Ravelry.) I’m a big fan of the traveling lace-panel in this sock, and will probably knit another pair of socks with this design feature sometime in the near future — Cookie has lots of great patterns that use them! The yarn is Sundara Sock in the Antilles colorway, which I received in a deep-discount grab-bag sale that they ran a few months ago, where the color of the yarn you were buying was a surprise. While I’m happy with this color and generally love turquoise, I have to admit that I was hoping for a skein of something that would push me out of my color-comfort-zone a little more. But the yarn was a good match for this pattern, which called for Koigu, and Sundara Sock is very Koigu-like in its weight and texture. 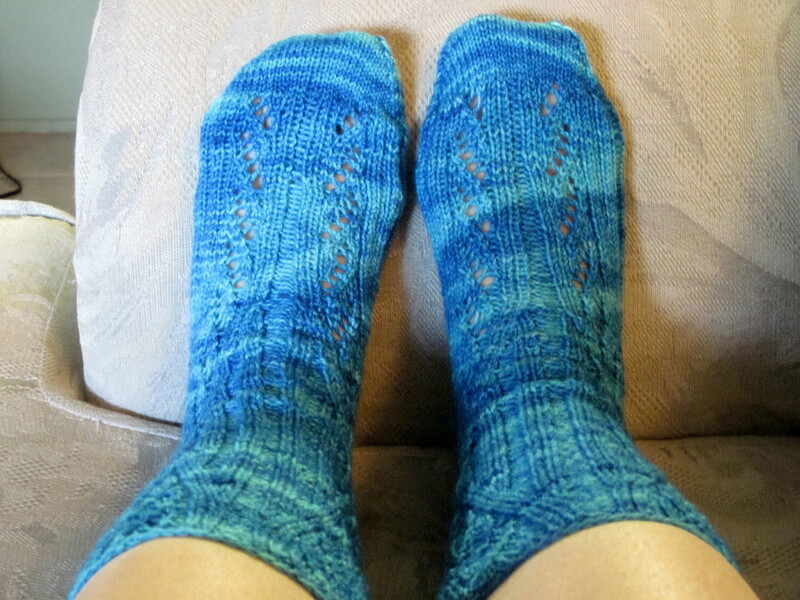 As you can see in this photo, there’s quite a bit of color-pooling, but I don’t mind very much since I basically just wear my hand-knit socks as super-fly slippers around the house. It’s not very photogenic right now, but this is the beginning of a chuppah which I am honored to have been asked to knit for my friend Amanda’s wedding this summer. There is all of one chuppah pattern readily available on the internet and I wasn’t a big fan of it, but I found a square blanket pattern which I liked much better: Serenity. 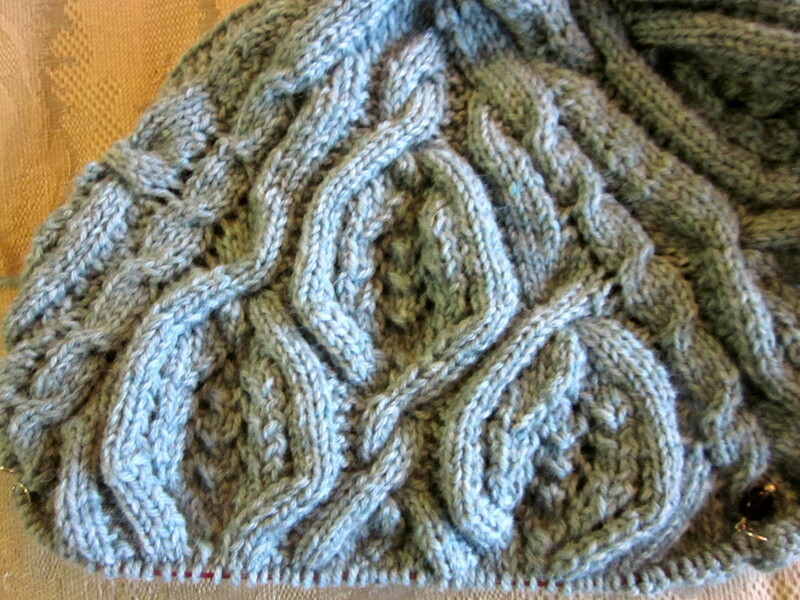 The motif looks hilariously vaginal in this picture, but trust me: once it’s stretched and blocked, these will be beautiful, intertwining, only-slightly-vaginal cables. It grows very quickly because of all that negative space, but it’s also been neglected for awhile. I’d say it’s about halfway done at this point. The pattern was a little mind-bending at first, but I’ve made friends with it now and it’s actually quite easy to execute. Soon — later this week, I hope! — I’ll have not one but two new finished objects to show you. Stay tuned! Hello and happy 2013! Now I can finally reveal to you all of my holiday knitting. 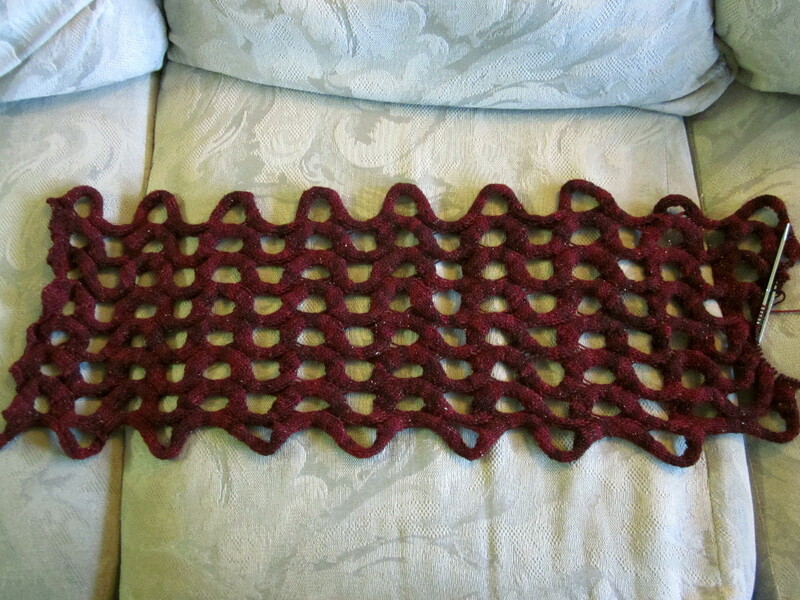 What you see here is the reversible cabled scarf I knit for Pat. Unfortunately I didn’t finish this in time for him to wear it when he was visiting my family on the east coast — it still needs washing and blocking — but it’s so gorgeous that I felt compelled to lead off with it anyway. The pattern is Deliah by Bobbi Padgett, and the yarn is Alpenglow Sporty Rambo (rambouillet wool) in the colorway “Deep Space Blue.” I hope to do another photoshoot once it’s washed and blocked! These here are Mysterious Mittens made for my dad, who is allergic to wool — so they’re knit in Wendy Peter Pan DK New Soft Blend, a pretty decent acrylic. 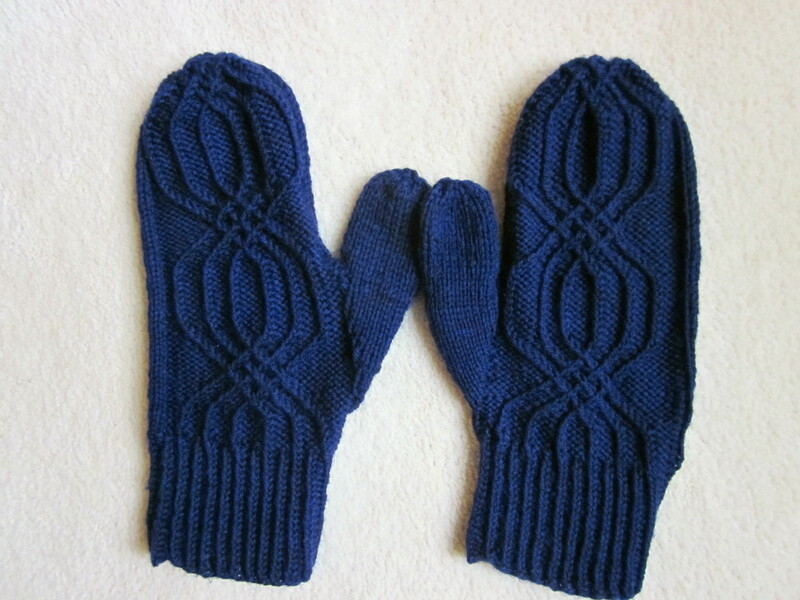 He requested “lightweight mittens,” so this DK-weight pattern seemed to fit the bill perfectly. 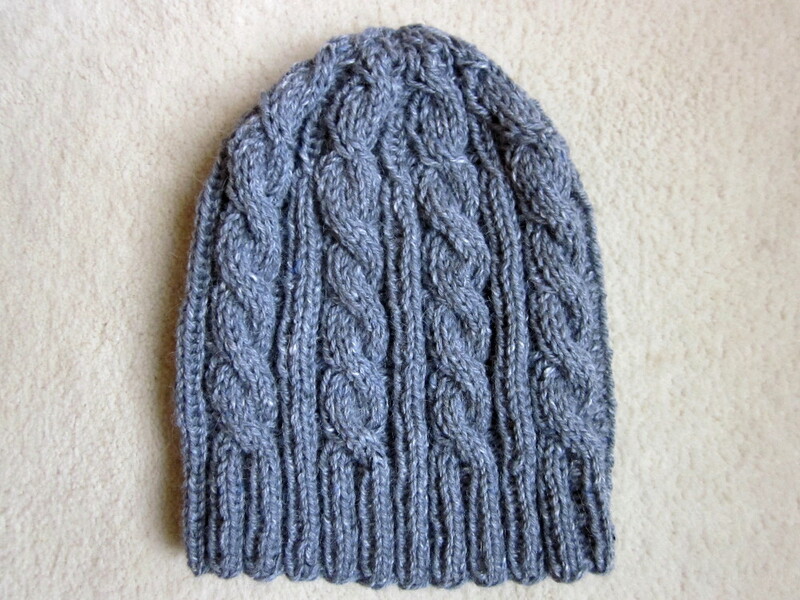 I also figured this pattern in this color would match the Koolhaas Hat I knit my dad a few Christmases ago! This is a 3AM Cable Hat knit for my brother to match the Palindrome Scarf I knit him last year. Both are knit in Classic Elite Portland Tweed, in colorway “Folkestone”– this is literally made of the leftovers from last year’s scarf. 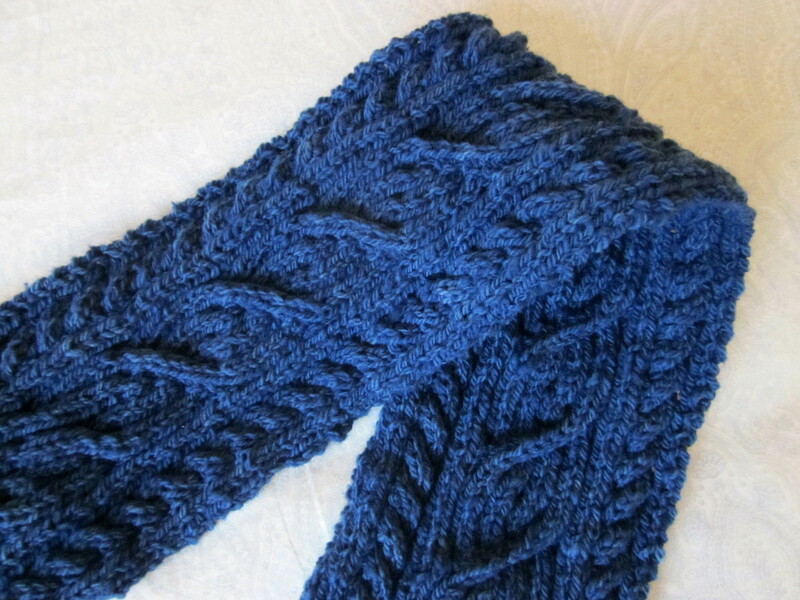 I finished that scarf on the 23rd, so I didn’t have time to knit the hat last year! Both these patterns are riffs on the classic “Irish Hiking Scarf” pattern, but the Palindrome Scarf is reversible (it was my first experience with reversible cables), and the 3AM Cable Hat is, well, a hat. There are several “Irish Hiking Hats” out there, but after careful scrutiny I decided this pattern was the best of the lot. Pat and I had hoped to get modeled shots of it on me before he left, but we didn’t have time — it really looks fabulous on a person; it’s so wide and squishy and luscious. It’s my first Olga Buraya-Kefelian pattern, though I’ve been a fan of her innovative designs for awhile. 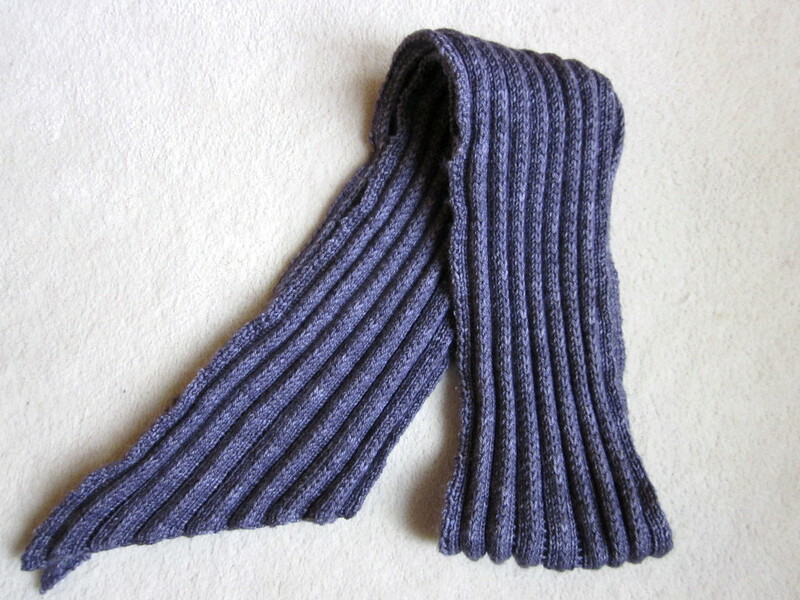 This is knit from the leftover Madelinetosh Pashmina in “Composition Book Grey” (which is quite purple!) from my Leaving Cardigan. I knit this on size 4s rather than 5s as the pattern specifies because it looked like the pleats were holding their shape better on 4s. I was a little worried, though, that the resulting scarf was too dense and stiff — until I blocked it, and it relaxed beautifully. I love this so much that I really might knit another one for myself despite how tedious the knitting is — I’ll have to keep my eyes open for more Pashmina! You may have noticed that this site’s appearance has slightly changed — I “upgraded” it to a newer version of the WordPress theme I had been using. I basically like the new look better, but one thing that’s weird about it is that all parts of it, including the pictures, look washed out until you mouse over them. It’s apparently supposed to look like things are “rising out of the mist,” but it’s not great for a photo-oriented blog. Bleh. Anyway, please do mouse over the pictures to see them at their full saturation! I have more to share with you, but I’m going to wait until next time to show you what I’ve been working on since the holidays. Cheers!